Murrayfield Racers travel to Dundee Tigers tonight in Scottish National League action looking to get their season “back on track” following a tough run of defeats whilst stepping up in class to participate in the UK-wide National Ice Hockey League’s North Cup. 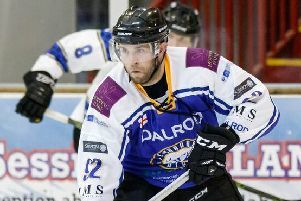 Racers director of hockey, Tony Hand, believes a return to domestic action is what his team needs, before playing NIHL opposition once more in the form of Solway Sharks at Murrayfield tomorrow (face-off 6pm). Racers welcome back teenage defenceman Patrik Grigors after five weeks out with a shoulder injury and may choose to blood some players from the Murrayfield junior set up against Tigers, who have failed to win a game so far this season. Hand said: “We’ve been on the road for the last month against some very good teams and it’s important for us to get a win to get some confidence back. Our guys are desperate to get back on track and tonight gives us a chance to do that, plus it’s in our own league so it’s really important for us to get some points. “We’ve got a few guys from the juniors like Lewis Young who plays for our under-16s in the squad, just to give them that wee bit of experience. “It’s going to be great to be back in front of our own fans tomorrow, but it’s going to be really tough against Solway who are a team with a lot of depth and experience. But we want to put on a much better showing than we managed on the road against them (in an 11-0 loss).